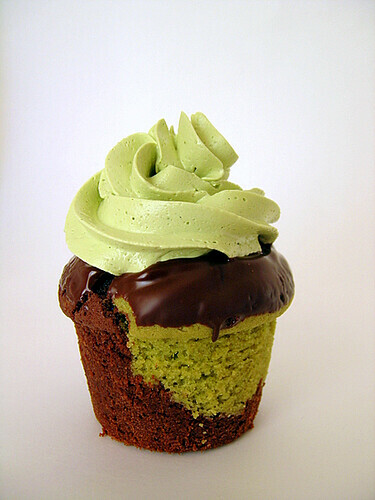 I call it the matcha cocoa cupcake, because it does taste similar to the matcha hot cocoa recipe I enjoy. The chocolate cake in these cupcakes are very chocolatey, and the matcha is very matcha-y. The cake is dense and heavy and quite filling. The dark chocolate ganache is a nice touch, and the matcha Swiss meringue buttercream is to die for. This is my second attempt at making SMBC (my first attempt failed) and it went really well. The texture is amazing, almost mousse-like. It pipes really well. The matcha taste in the SMBC is not overpowering and adds an extra light matcha flavor. Stay tuned for Jamieanne's guest blog right here on December 9th! This looks like the cupcake of my dreams. I love maccha, chocolate, and cupcakes. When I'm allowed to eat cake again, I must seek one of these out, or figure out how to make it myself. I have looked at this cupcake several times. I think its so pretty! i made this cupcake and it would have been really great if it wasnt so firm.. i thought that it was a little stale tasting.. i didnt overcook it so i am not sure what the problem was.. has anyone else had this problem?? what can i do to make it moister?? We're going to be having another matcha green tea powder recipe contest. Your matcha cupcake recipe would make a great entry! Let us know if you would like to enter the contest.